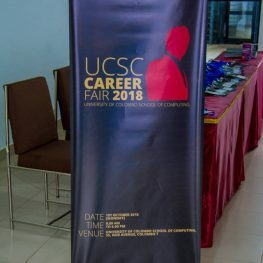 UCSC Career Fair 2018 was organized by fourth year undergraduates of UCSC in collaboration with Professional Development Center of UCSC. The event was held on 1st October, 2018 at the University of Colombo School of Computing premises. Organizations from the IT industry get an exclusive opportunity to meet with outstanding students and conduct interviews, recruitment and company presentations to showcase their organization and to inform of every available career opportunities, at this event.